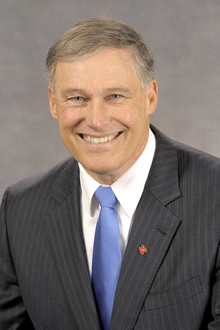 Citing "serious concerns about the use of capital punishment in the state of Washington," Governor Jay Inslee (pictured) granted a reprieve to Clark Richard Elmore, whom the state's Department of Corrections had scheduled for execution on January 19, 2017, and urged the state legislature to abolish capital punishment in the state. The December 29, 2016 warrant of reprieve was the first reprieve order issued under a moratorium on executions that the governor announced in 2014. The warrant prevents Washington from executing Elmore unless and until the reprieve is lifted by Inslee or a future governor, but it does not reduce Elmore's sentence. The Governor's office said Inslee spoke with the victim’s family, "who expressed a preference to see Elmore serve life in prison," before issuing the reprieve. The warrant of reprieve reiterates several of the concerns about the death penalty that led Gov. Inslee to impose the moratorium in the first place, including "[u]nequal application across the state, lack of clear deterrent value, high frequency of sentence reversal on appeal, and rising costs." It states: "The State's two most important responsibilities in addressing criminal justice issues are to protect the public and to ensure equal justice under the law, and I do not believe the use of capital punishment effectively satisfies these responsibilities." In a separate statement to the media, the governor's office said the state's moratorium on executions was based on systemic concerns and "isn’t about individual cases." Because of those concerns, the statement said, "[t]he governor urges the state legislature to end the death penalty once and for all." Nine men are currently on death row in Washington, and the state's last execution was in 2010. (D. Oxley, "Gov. Inslee halts execution for Whatcom murderer Clark Elmore," MyNorthwest.com, December 30, 2016; J. O'Sullivan, "Washington Gov. Jay Inslee quietly spares killer with first death-row reprieve," The Seattle Times, December 30, 2016.) Read the Warrant of Reprieve for Clark Richard Elmore.